The Second edition of the World Forum on Urban Violence and Education for Coexistence and Peace was held in Madrid, at the invitation of Mayor Manuela Carmena. United Cities and Local Governments was part of the organizing committee of the event, which gathered over 5000 participants from which around 400 were local and regional government officials from more than 35 different countries, as well as Nobel Peace laureates, and experts on peacebuilding from all the world, and served as a frame of action to prevent and transform conflicts and reduce urban violence. The Outcome Document of the Forum, the Commitment to the Agenda of Cities for Coexistence and Peace, expanded upon the line of work that had been opened during the first Forum, which explored the links between SDGs 11 and 16: between building sustainable, resilient cities, and promoting peaceful and inclusive societies. The Commitment to the Agenda of Cities for Coexistence and Peace vows to create cities that are spaces where people thrive, cities of peace where violence has been ended not by shunning away from conflicts, but by acknowledging that conflict is inherent to all societies and that it should be addressed in such a way that it does not transform into violence. The Forum defined peace not as the opposite of war, but as the opposite of violence. Cities that are committed to constructing coexistence and the consolidation of peace should strive to put an end to all forms of violence, be it direct -that which is visible and palpable at first glance, such as war, crime, gender violence- structural -stemming from injustices that enable and perpetuate violence- or cultural -violence that arises from beliefs and ideology, and that which is used to legitimize the other forms of violence. The role of local governments in peacebuilding is tied to the management of conflicts. From fostering gender equality and preventing violence against women, to managing migration and social conflict (including fighting racism, crime and corruption) and guaranteeing the right to the city for all were among the axes identified by the Declaration in order to put an end to urban violences. Doing so would also require facilitating the participation of all stakeholders in the diagnosis, decision-making and implementation of the agreements, which is part of the role of local and regional governments in that regard, and is also essential towards building peaceful cities that leave no-one behind. The need to acknowledge caretaking policies was also introduced as a means to solve urban violence. Caretaking -often a gendered, overlooked job- and addressing conflict before it becomes violence, is essential towards the achievement of peaceful societies. Prevention is key to address violence, and policies of care are essential to mitigate and prevent the growth and spread of violence. The Commitment adopted by the cities that took part in the Forum aims to initiate a process that involves local governments throughout the world, as well as different stakeholders from various sectors, to set in motion public policies and cement territorial alliances aimed towards saving lives and transforming cities. 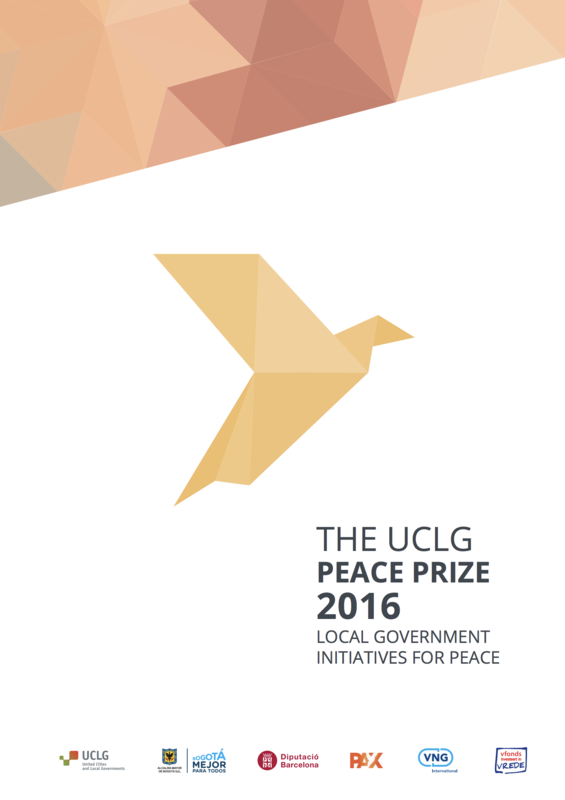 UCLG aims to shed light on the role that local governments are already playing in peacebuilding, conflict resolution, which is why the World Organization launched the UCLG Peace Prize for the first time in its World Congress in Bogota. The call for applications for the second edition of the UCLG Peace Prize was launched by the UCLG World Council gathered within the World Forum on Urban Violence and the prize will be awarded to the winners at the UCLG World Congress in Durban (2019).